The DriSteem High-pressure system provides evaporative cooling and humidification in multiple zones and in a wide variety of applications. Humidify to enhance indoor air quality, manufacturing process, material longevity and comfort while taking advantage of the free cooling and energy savings inherent with this technology. 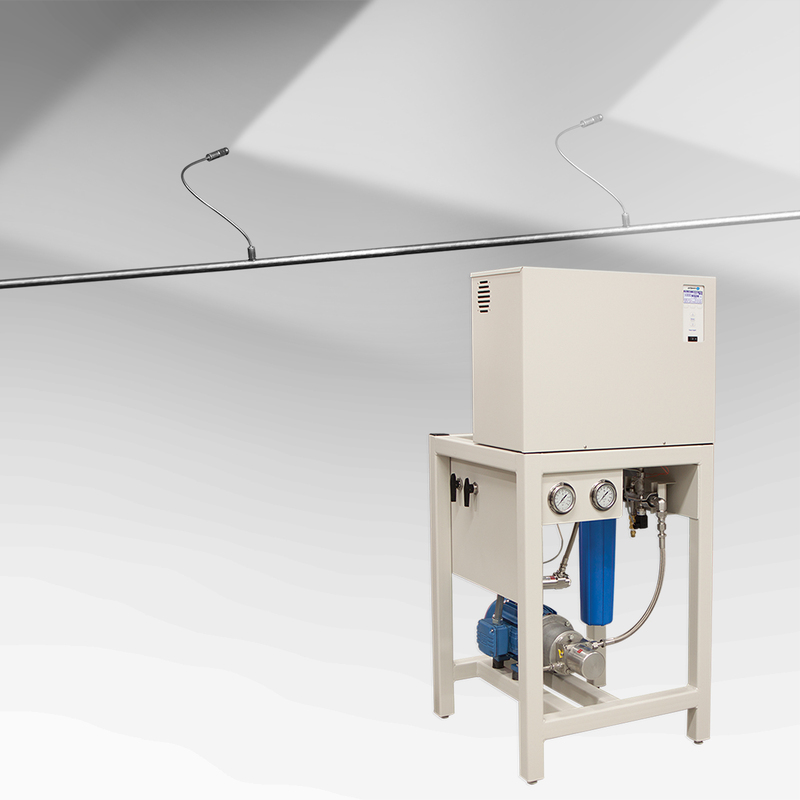 The DriSteem High-pressure system handles every aspect of the application from the potable supply water source to the cooled/humidified conditions in the air handler, duct or space. DriSteem's High-pressure system uses heat already present in air to evaporate evenly distributed water droplets dispersed by the system, saving on energy costs. As atomized water droplets are absorbed, the evaporation causes air temperature to drop, reducing the cooling load. This provides significant energy savings when cooling and humidifying simultaneously. The system's Vapor-logic® controller monitors multiple conditions to modulate and control nozzle operation. This optimizes absorption and minimizes water waste. Applications: Any application requiring cooling or humidification. Especially suited for applications requiring simultaneous cooling and humidification. Commonly used in data centers, industrial manufacturing, printing facilities, and applications using air-side economizers. Options: Available water treatment options provide ultra-pure water that leaves no white dust – see our water treatment systems page. BACnet® or LonTalk® communication protocols. Redundant high-pressure water pump.